hi nijimasu, I just discovered your place, Simon666 kept an eye (no, ear!) open for me and winked me about a new Summertime version by the Randy Rayment Quintet, here on endless planets [;-) I collect as many as possible Summertimes, a bit crazy I know.... 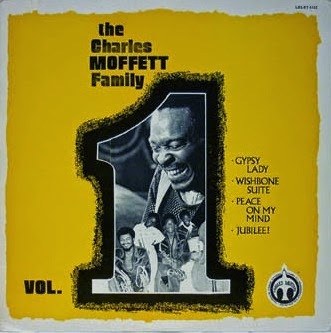 But this Charles Moffett Family album is just CRAZY good, wow! Thanks for sharing, even played it for my girlfriend, she like it too (not being a jazzhead at all!). I still hear reminiscing sounds from Ornette's thingys in this music, though far more bluesy/gospel/soul - spiritual indeed...Listened to this 4 times past week, it's a gem, again thank you. hey e-mile, thanks for the kind words, much appreciated. had a look at your place, very interesting comps you've got on there. have you by chance heard the version of summertime on this album: http://www.discogs.com/Lee-Gagnon-La-Jazztek/release/3976282? also a great version of take five on there too (looks like you did a take five comp awhile back as well). if you haven't and are interested, ill send you a link. cheers! Would be appreciated if you could drop me a link, indeed! I also just discovered Endless Planets. Great music! Big thank you for this! I've been wanting to hear this for a while, after listening to Moffetts' "The Gift." Really excited to hear this. Thanks again!